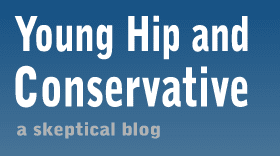 Young, Hip and Conservative: a skeptical blog: Voter ID doesn't matter. Over at Congress Shall Make No Law, Nate recently wrote about requiring voters to show a photo ID. I can't think of another recent issue so marked with ridiculous notions of what the impact of the legislation would be. 1) Not requiring a photo ID to vote will result in phony votes being cast, changing the results of an election. 2) Requiring a photo ID will block poor people from voting, changing the results of an election. I think both are so unlikely as to be ridiculous. Each individual vote counts for so little, that if you have a conspiracy of fake voters casting votes in person, you are involving so many operatives in order to have any impact that you can expect the whole scheme to be blabbed to investigators. Likewise, the idea of a registered and likely voter who possess no photo ID is absurd. You can not function in modern America without such ID. How do you cash a paycheck, unemployment check or welfare check without one? How likely would someone be to vote in the first place who doesn't possess a Driver's license or a state ID? The scenario's both sides draw up are absurd. It's not asking much to require voters show an ID, and it's not a big risk to the voting process to have no such requirement. The real motivation here is both sides think they will see votes slightly tip in their favor. The Democrats in opposition are worried that their voters will be left out, and the Republicans are worried a small group of leftist activists will cheat a few more votes in on their side. This was never about principles. I just think its such a natural requirement, that I'm shocked that it's not a requirement everywhere. If saying you are who you are is enough to vote, it should be enough in buying tobacco or on a traffic stop. Regardless of the possible consequences (or lack of them) in not requiring ID, it seems a bit of a hole in what should be a high confidence institution. One person, one vote, reasonable safeguards, irregardless of the statistical insignificance of each vote.